The firm of CF (designers Catellia and Fiorani) had started building powerful little 173 cc and 248 cc OHC singles in 1928. They were very successful in racing. In 1937 the CF factory was taken over by the Fusi firm, which were the Italian FN importers. Next to the racing types with OHC engine, Fusi produced machines with J.A.P. engines that were built in Italy under licence. Fusi used gearboxes that were actually Burman designs produced under licence by FIAT. 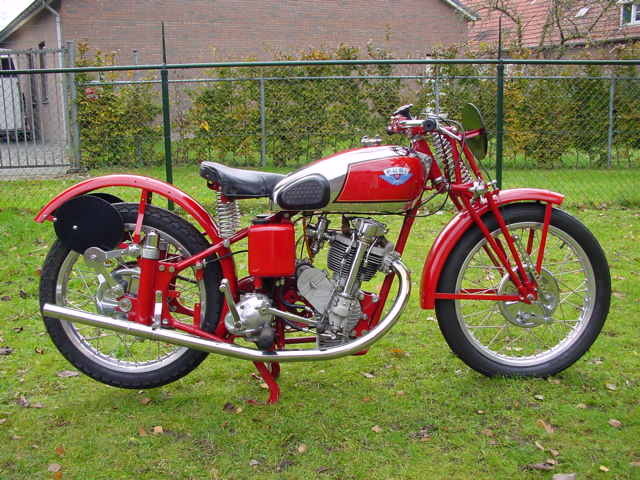 1937 Fusi OHC Racing, 248cc This beautifully restored piece of engineering has a four speed foot change gearbox, square engine dimensions of 68x68 mm, plunger rear suspension and hairpin valve springs.